April 1, 1916, marked the U.S. Coast Guard’s aviation birthday, the date when 2nd Lt. Charles E. Sugden and 3rd Lt. Elmer F. Stone reported for aviation training. While there are many notable, heroic rescues, here are a few of the most daring lifesaving operations in Coast Guard history, in no particular order. In July 1934, Frank A. Erickson became a Coast Guard aviator, and some time later he was designated the service’s first helicopter pilot. In 1944, he conducted the first lifesaving mission – in snow squalls and strong winds – with a helicopter. Over the years, the service has honed its airborne techniques of search and rescue (SAR), which is one of its 11 statutory missions, assisting people in danger on the high seas and inland waterways. The Dutch cruise ship Prinsendam, steaming through the Gulf of Alaska near Ketchikan, caught fire in its engine room at midnight on Oct. 4. The ship’s captain ordered 520 people – 320 passengers and 200 crewmembers – to deploy the lifeboats and abandon ship, more than 150 miles from the nearest coast. The Coast Guard got underway with what would become one of the largest rescue operations in U.S. history. Coast Guard and Canadian helicopters and the CGCs Boutwell, Mellon, and Woodrush as well as rescue aircraft launched from air stations Sitka and Kodiak, and with assistance from the U.S. Air Force, Royal Canadian navy, and an Automated Mutual Assistance Vessel Rescue System-tasked tanker, the service began the coordinated operation of aiding the passengers. Their efforts lasted 24 hours in 12- to 15-foot seas and winds of 28 to 35 mph, despite the fact that the Prinsendam was positioned 130 miles from the closest airstrip. 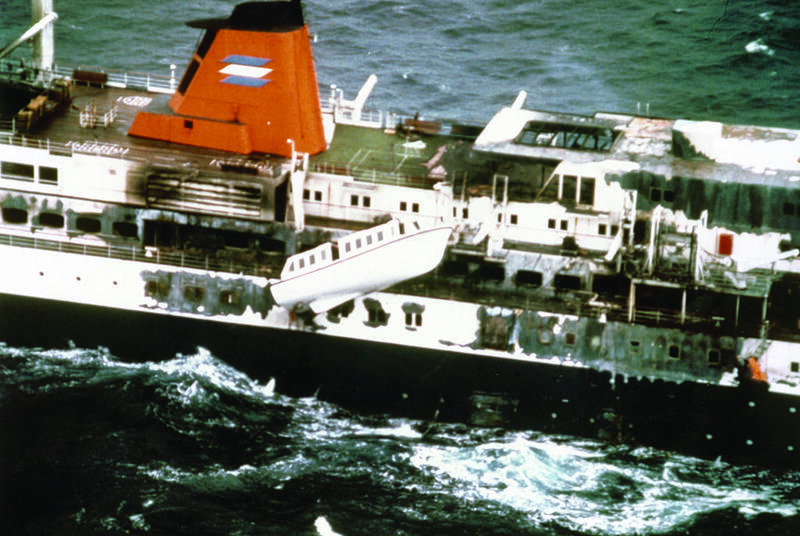 Rescue helicopters would transport to shore passengers who were hypothermic and the aircraft would refuel and return to the scene to pick up another load of survivors. As a result of coordination and teamwork among the rescue parties, all 520 aboard were rescued and no one sustained serious injury. At 2:52 a.m. on March 23, and 120 miles west of the Aleutian Island port of Dutch Harbor, Alaska, the captain of the 189-foot fishing trawler Alaska Ranger sent a distress call that was picked up at U.S. Coast Guard Station Kodiak.